In March 2019, 27 SGX primary-listed stocks repurchased as many as 50 million shares with a total consideration of S$54 million. This was up from S$32 million in Feb 2019 and down year-on-year from S$222 million in March 2018. 5 stocks commenced new buyback mandates in the month of March 2019: Hong Fok Corporation, Kimly, Aspen (Group) Holdings, MDR & GRP. Relative to outstanding shares, Hong Fok Corporation bought back 0.77% of its shares during the month. 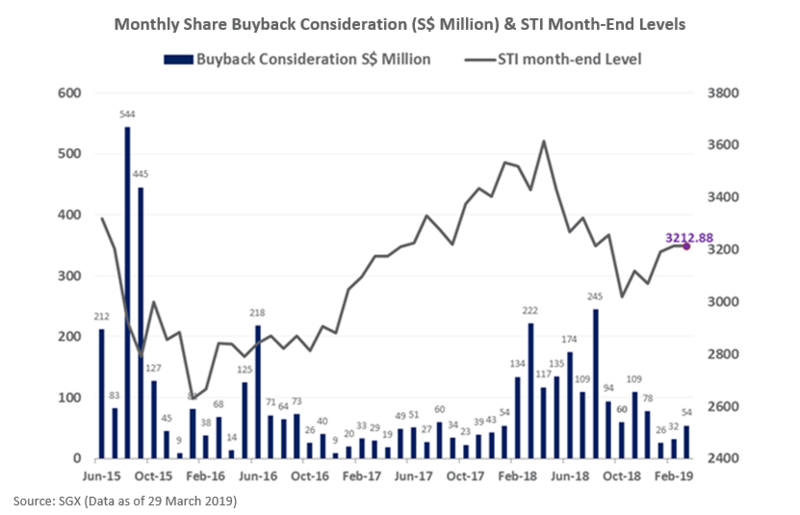 The March 2019 buyback consideration was led by OCBC, Hong Fok Corporation and Singapore Technologies Engineering. OCBC made up a quarter of the total consideration, and as of 1 April, had bought back 0.33% of its shares on the current mandate. Total share buyback consideration for the month of March 2019 totaled S$53.5 million. There were 27 SGX-listed stocks that reported buybacks of their SGX-listings over the month, buying back a total of 49.8 million in shares or units. The S$53.5 million in buyback consideration was two-thirds higher than the buyback consideration of S$31.9 million filed in February 2019 (click here for more). Last month, the Straits Times Index (“STI”) generated the thinnest of marginal gains, moving from 3,212.69 at the end of February, to 3,212.88 at the end of March. Dividends however, boost the total return of the STI to 0.3% for March, bringing the total return for the last quarter to 5.1%. As detailed in the FTSE Asia Monthly Report (click here), Singapore’s Mid Cap stocks continued to be amongst the best performers in March within the FTSE ST Index Series, gaining 2.2% over the month. The FTSE ST Mid Cap Index generated a total return of 11.8% over the first quarter of 2019. As best practice, companies should refrain from buying back their shares during the two weeks immediately before its quarterly financial statements and one month immediately before the full-year financial statements. Hong Fok Corporation bought back 6,698,500 shares for a consideration of close to S$5,957,080 during March. The buyback mandate was approved back on 30 April 2018 and these are the only buybacks filed on the corporate announcement page which dates back to 2014. Kimly bought back 430,100 shares between 27 March and 29 March, on the mandate approved on 30 January 2019. On the previous mandate, Kimly bought back a total of 2,889,100 shares. Aspen (Group) Holdings bought back 22,600 shares between 21 March and 27 March on the mandate approved on 29 January 2019. MDR bought back 2,480,800 shares between 11 March and 13 March on the mandate which approved on 28 September 2018. GRP bought back 2,000 shares on 26 March on a mandate approved on 26 October 2018. The table below summarises the buyback considerations in March 2019. The table is sorted by the value of the total consideration amount for the month, which combines the amount of shares or units purchased and the purchasing price of the transactions. * Percentage of company’s issued shares excluding treasury shares as at the date of the share buyback resolutions. Share buyback transactions involve share issuers repurchasing some of their outstanding shares from shareholders through the open market. Once the shares are bought back, they will be converted into treasury shares, which means they are no longer categorised as shares outstanding. Other motivations for share buybacks include companies moving to align stock valuations with balance sheet objectives. The date of the relevant share buyback mandate is also provided in the table above, in addition to the amount of shares authorised to be bought back under the mandate. The total number of shares purchased under the mandate and the percentage of the companies that issued shares that have been repurchased under the mandate are also provided. Share buyback information can be found on the company disclosure page on the SGX website, using the Announcement category and sub-category of Share Buy Back-On Market.